Samajwadi Party leader Amar Singh today appeared before the Delhi police special cell in connection with investigations into his phone tapping case. Mr Amar Singh, general secretary of the party, had alleged that his phone was being tapped at the behest of Congress leaders. The Samajwadi Party leader accused the Intelligence Bureau of conspiring to finish him and BJP leader Pramod Mahajan. The Bombay High Court yesterday rapped the Maharashtra Government over the slow progress in demolishing illegal constructions in the township of Ulhasnagar in Mumbai’s outskirts. The court’s displeasure at the slow progress of the demolitions came when the state government submitted an affidavit in the matter. Faced with a situation where a doctor was denied admission in a postgraduate course in medicine despite having topped the entrance examination, the Supreme Court today sought the Centre’s view on whether general category candidates could be denied admission in order to increase the number of seats to be filled through all-India test. The Chief of the Army Staff, Gen J.J. Singh, today stressed that the process of acquiring more than 400 155mm Howitzers was proceeding smoothly and ruled out demilitarisation of the Kashmir valley as the terrorist infrastructure remained intact across the Line of Control. “Our projection of the artillery profile of the Army is to have the 155mm calibre howitzer as our primary weapon and we are proceeding on the acquisitions,” the Army chief told mediapersons here on the eve of Army Day. While the Greenpeace today claimed that the India-bound decommissioned French warship Clemenceau was now moving towards the Mediterranean Sea after the French and Indian governments failed to provide the Egyptian authorities required documents, an Indian official said the government had not received any communication from the Egyptian Government with regard to the ship. Women traffic marshals in Chennai. PM releases book on history of the Sikhs. Abu Salem alleges torture by Anti-Terrorist Squad. Prasoon Joshi steps into dialogue writing with Rang De Basanti. Samajwadi Party leader Amar Singh today appeared before the Delhi police special cell in connection with investigations into his phone tapping case. Mr Amar Singh, general secretary of the party, had alleged that his phone was being tapped at the behest of Congress leaders. The Samajwadi Party leader accused the Intelligence Bureau (IB) of conspiring to finish him and BJP leader Pramod Mahajan. Speaking to mediapersons after his 90-minute interrogation, Mr Amar Singh alleged that tapping had been outsourced to private detective agencies by the IB. He said the main accused were yet to be arrested. The police has so far arrested three persons, including two private detectives. Anurag Singh, arrested in this connection, is accused of having been indulging in exploitation and extortion even before this case came to light, police sources said today. Anurag, an expert in computer software despite holding an MBBS degree, was found allegedly indulging in extorting money from people, mainly girls, after intercepting their e-mails, the sources said. Known as “doctor saab” in his circles, Anurag had approached the Delhi police and some intelligence agencies about two years back claiming that he had developed a software which could intercept Internet communication and electronic mail, they said. He had offered the services to the police and agencies to help them in their task of monitoring communications between suspected people. A security check was carried out on him after the offer which revealed that he was accused of indulging in extortion, they said. Anurag, who was arrested on January 6, had been running a private detective agency. The police believed that Anurag had tapped Mr Amar Singh’s phone jointly with Bhupender, owner of another private detective agency, who was arrested on December 30. However, Anurag had told a local court that he was approached by Bhupender with the tapped conversation to sell it to Amar Singh’s political opponents. A laptop had been seized from Anurag which was allegedly used by him to convert the recorded conversation in an audio CD. The laptop has been sent for examination to the Central Forensic Science Laboratory, Hyderabad, for examination. Kuldeep, a despatch rider with Reliance Infocomm, had been arrested for allegedly facilitating the tapping of phones of Amar Singh. The police has been raiding several places in Haryana and Uttar Pradesh to arrest Vijay Dhawan, who is believed to have forged the letters of senior police and Delhi Government officials sanctioning the interception of the telephone. The Bombay High Court yesterday rapped the Maharashtra Government over the slow progress in demolishing illegal constructions in the township of Ulhasnagar in Mumbai’s outskirts. The court’s displeasure at the slow progress of the demolitions came when the state government submitted an affidavit in the matter. Mr Justice Lodha then ordered the Principal Secretary, Urban Development, to personally monitor implementation of the order. The state government was also ordered to submit a status report on the matter by January 24. The court further said the Principal Secretary would be held liable if the high court order was not properly implemented by the Municipal Commissioner of Ulhasnagar. The court, had, last year ordered the demolition of 855 illegal structures after they were found to be violating building norms. However, pressure from politicians across-the-board resulted in just 10 structures being pulled down. The Chief Minister, Mr Vilasrao Deshmukh, tried to circumvent the court’s order by issuing an ordinance to regularise the illegal constructions on the grounds that most of the residents of Ulhasnagar were refugees or descendents of refugees from what is now Pakistan. However, Maharashtra Governor S M Krishna returned the ordinance for further clarifications. Seeking further clarifications on the ordinance, the Governor noted that such a measure could amount to contempt of court. He said passing the ordinance would mean disrespecting the court and the state should either file an affidavit in the court or be party to court’s decision. Ulhasnagar, in the outskirts of Mumbai, grew following the Partition when thousands of refugees from Sindh were settled here. Over the years, the barracks originally housing the refugees made way for high-rise buildings, many of which came up flouting building norms. A Bench headed by Chief Justice Y.K. Sabharwal asked the Centre to examine as to how all-India seats in Medical Council of India (MCI)-approved PG courses could be increased from 25 per cent to 50 per cent. One N. Senthil Kumar, who topped the entrance examination at the Jawaharlal Institute of Postgraduate Medical Education and Research, pointed out in a petition before the Supreme Court that he was denied admission by the institute on the ground that all 18 general category seats had been surrendered for being filled through all-India quota. The institute said the Supreme Court, on February 21, 2005, had passed an interim order directing that 50 per cent of total PG seats had to be surrendered to the all-India quota. Kumar, who topped the list of 5,485 candidates has contended that surrender of all general category seats was against the principles laid down by the apex court in various judgements that reservation could not wipe out all open general category seats. The interim order nowhere said that all seats for general category students should be surrendered, he added. The court had not directed disproportionate allocation of seats, he said, adding that allocation of general category seats should have been proportional. Further, it was not mentioned in the prospectus that the examination was being conducted exclusively for institutional candidates, SCs and STs. The Chief of the Army Staff, Gen J.J. Singh, today stressed that the process of acquiring more than 400 155mm Howitzers was proceeding smoothly and ruled out demilitarisation of the Kashmir valley as the terrorist infrastructure remained intact across the Line of Control (LoC). “Our projection of the artillery profile of the Army is to have the 155mm calibre howitzer as our primary weapon and we are proceeding on the acquisitions,” the Army chief told mediapersons here on the eve of Army Day. He said the Army would carry out two trials — the summer tests in the deserts and the high-altitude tests in the winters — before deciding on the choice of Howitzers. “We will select the one which performs the best and meets all our parameters. It is then up to the government to approve. Whatever they (the government) decides, we will accept,” Gen J.J. Singh observed. “The induction of the new Howitzers is expected to begin by 2007 if we get the gun that meets all our requirements,” he said. 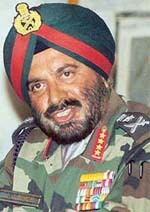 Gen J.J. Singh said the policy of “iron fist and velvet gloves” was paying dividends. This was evidenced by the dwindling number of casualties — 115 soldiers lost in 2005 as compared to 207 in 2003. While the SCMC will give its inferences in this regard to the Supreme Court on January 20, the official maintained that the export of the ship would be in violation of the Basel Convention only if it carried toxic cargo, which it does not. “As compared to its total weight, the asbestos content on the ship is negligible, he claimed, taking a somewhat stand similar to what French officials were reported to have been taking in Paris. Environmentalists, however, say the 27,000- tonne Clemenceau contains more than 500 tonnes of asbestos, which can pollute the soil and harm workers engaged in shipbreaking at Alang. Mr Ramapati Kumar once again reiterated that while banning the ship from its territorial waters, Egypt asked India and France to certify that the Clemenceau did not violate the Basel Convention on trade in hazardous material. “The ship is highly contaminated which is why Egypt sought all certificates required within the framework of the Basel Convention to allow the Clemenceau to pass through Egyptian waters and the Suez Canal. The high drama on the Mediterranean proves that France does not have required documents,” he said. He said the two Greenpeace activists were still on the ship. The two activists had intercepted the ship and unfurled a banner on its mast yesterday, aiming to stall the ship’s progress towards Gujarat for being broken up at Alang. Last Friday, the SCMC said the Clemenceau was not welcome in India. India would be a party to the violation of the Basel Convention on movement of hazardous wastes if it allowed the ship near the country’s exclusive economic zone, SCMC chairman G Thyagarajan had told reporters in Mumbai.